I took this photo back in August and had given it up for lost because it was backlit and dark… But then I learned a few tips and tricks in Adobe Lightroom and I salvaged it. Hooray! Wow! I could not even tell if you hadn’t told us. I would love to see the before and after picture. Nicely done! I spotted a flock in tree on my canoe ride yesterday. They are beautiful. You have captured every exquisite detail of that beautiful bird. Tell us how you did it. GREAT photo! I’d love to know how you saved it! Beautiful!! I am so glad I re-found your blog after stumbling upon it last year. Nice job–do share how you did it. in a ginko tree… cool! love your photo and the blog! Wow! So vivid! 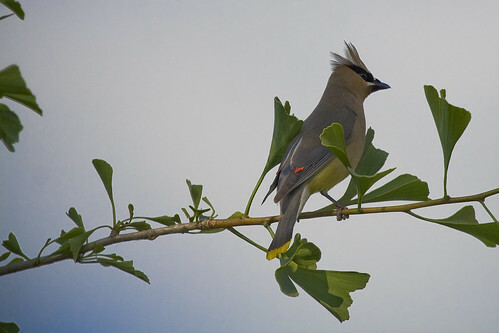 I’ve been trying to take “the” shot of a Cedar Waxwing, and this tells me I shouldn’t give up on my shots! LOL I love how the tuft sticks out! Please share the Photoshop details!